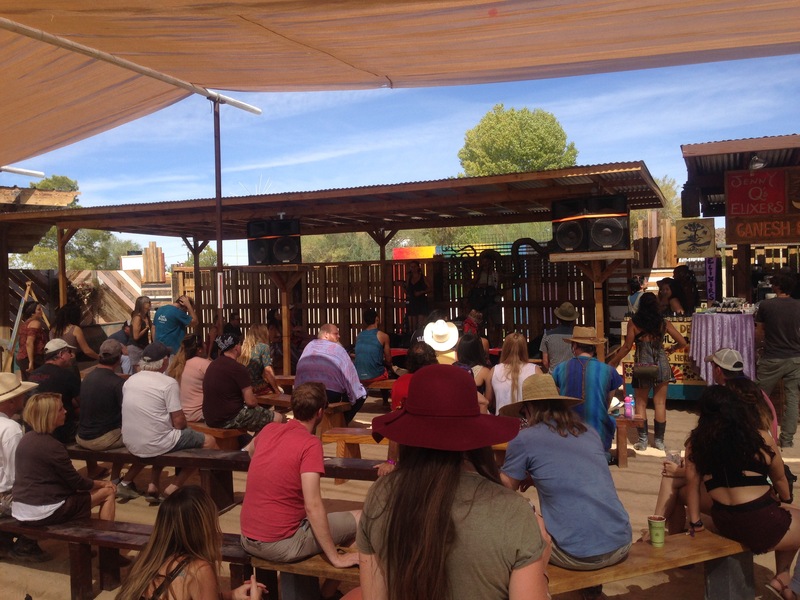 Twice a year, the Joshua Tree Music Festival happens in the desert of Southern California making up the Mojave and Colorado desert. 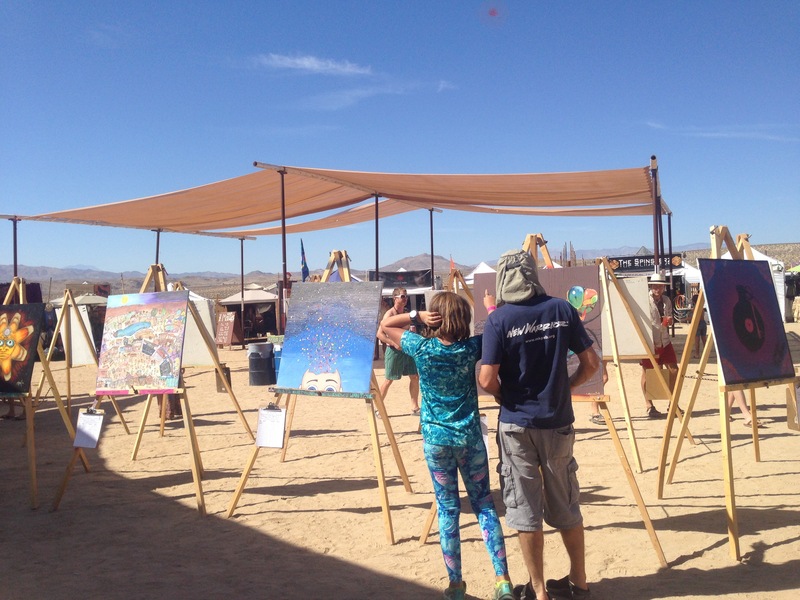 Its stunning, the size of Rhode Island and one of my places to gather to meet other artists, listen to international music and get to know more about Joshua Tree. This is my third festival with them. This year I decided to be apart of the Art Auction where 21 artists get together to do live painting throughout the festival. 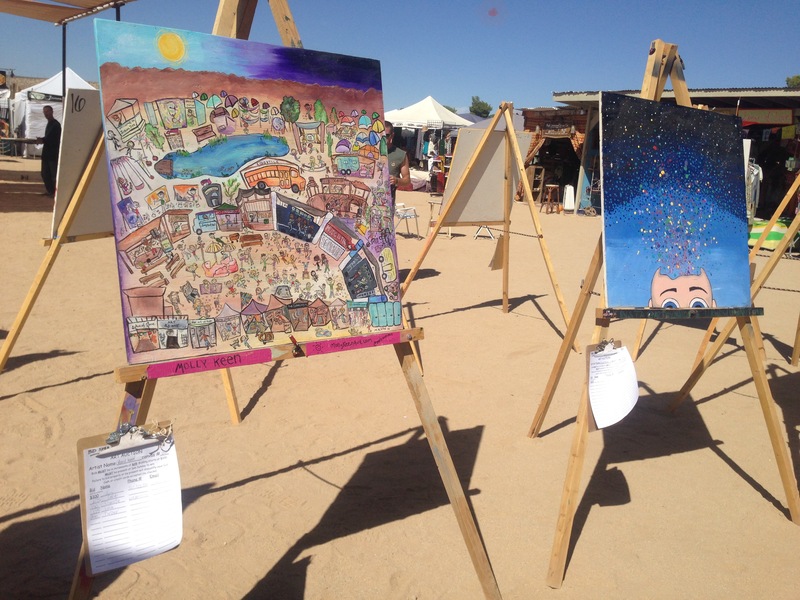 At the end, the pieces are put on display for a silent art auction where half the proceeds go to the music education fund in Joshua Tree. 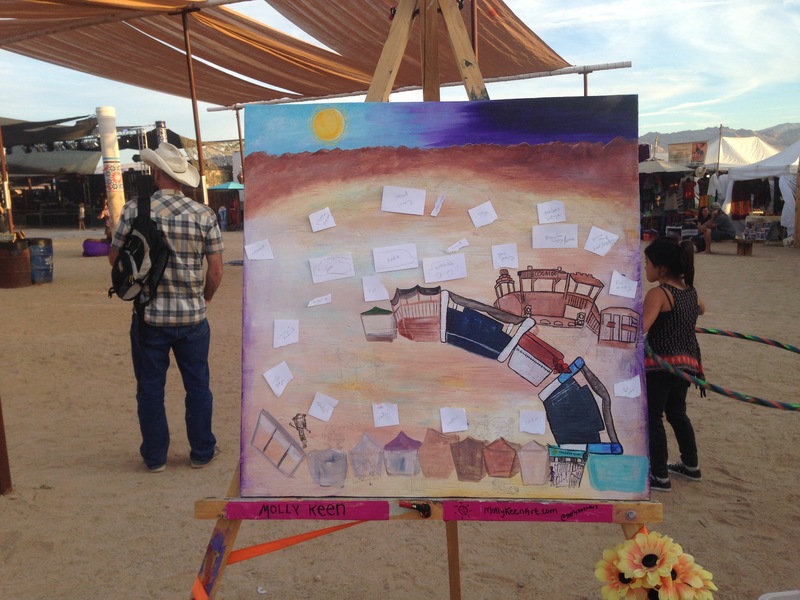 Its an amazing way to engage artists and the community. I love that the festival puts such value on the visual arts. 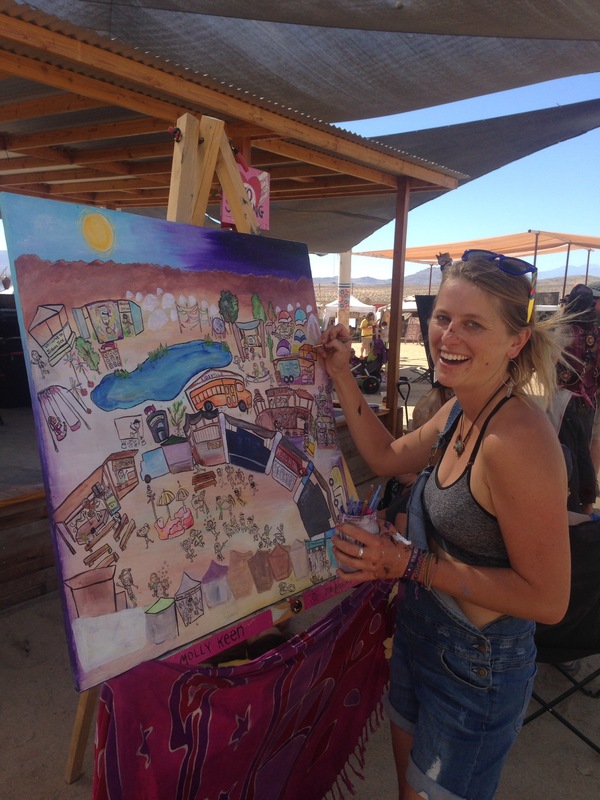 This year I decided to listen to some music and enjoy the festival before I immediately started painting. 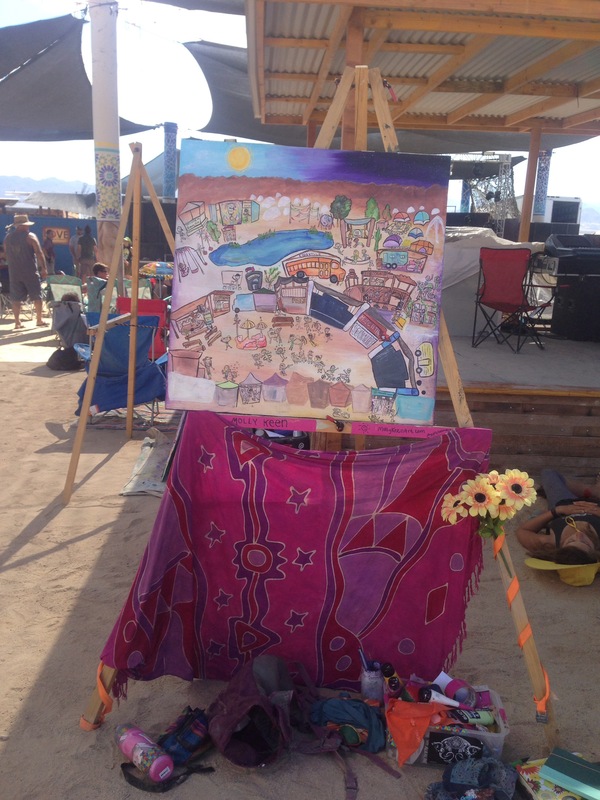 Last festival I had to paint an 8 foot by 6 foot piece so I was a bit more stressed out. This year it was 2 1/2 feet by 2 1/2 feet and I could carry it with me wherever I wanted. There was shade, thank goodness and I could actually listen to all the live music and I met a lot of people because they would enjoy the progress of my piece throughout the festival. Here are some process shots of how I painted the murals. Of course the background first, then slowly deciding where I wanted to put people and the parts of the festival. I walked around with my board for this part and just sketching in front of what I was painting. This was one of my favorite parts because people were super intrigued with this process. This also came with sticky notes so I could play with the composition and make sure I had room for the entire festival and all the things that made it so special. I spent most of my time shaded in the “Bowl” that included 3 musical stages and performances from 10am-11:30 pm with artists rotating almost every 1.5 hours. I listened to almost every set of music that was played. 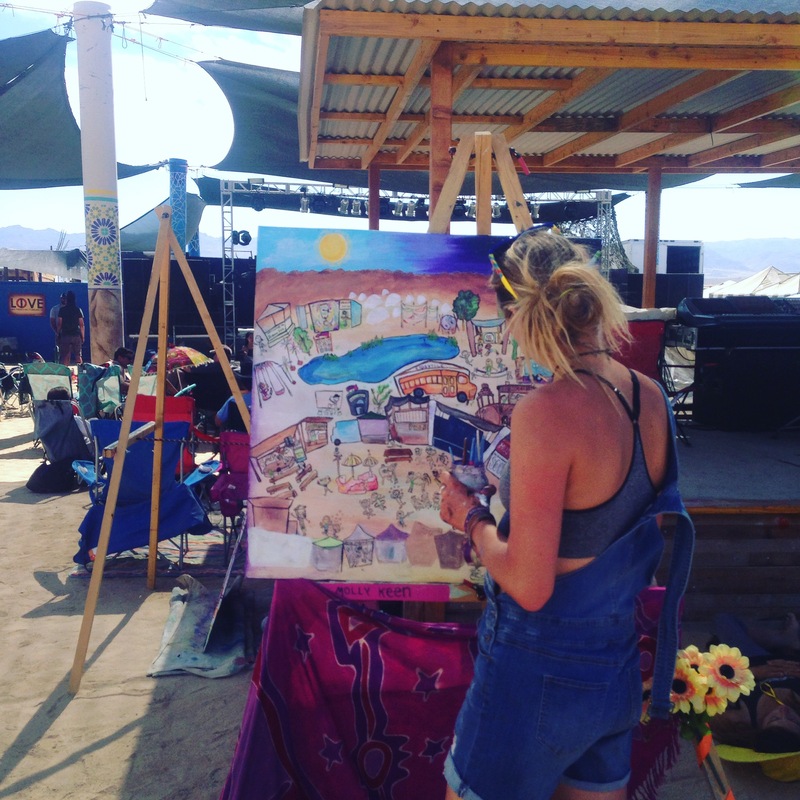 Quality music and painting combined made for a dreamy weekend. Below you can also see the silent art auction and how they set it up for us on the sunny Sunday morning of the festival. 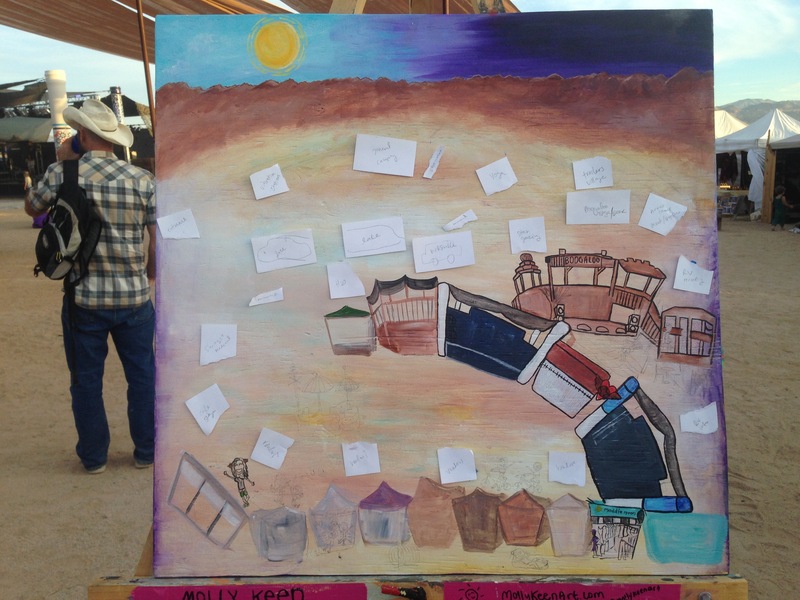 People could go around and write on the clip board how much they wanted to bid. I was a little nervous! I have to admit that I am not the biggest fan of people seeing my artwork before its done, let alone when it’s just in the planning stage and many people ask if it’s done. That is why I like the festival, to push myself and get out of my comfort zone of a studio or a blank wall inside alone. Music, friends, food, art, and workshops this festival was a great way to connect with the community and introduce art at the same time. My absolute favorite part of the weekend was getting to interact with people who were speaking about my painting, and then I was able to paint them into my piece. I loved the children getting excited about their cartoon character coming to life. My painting was a hit with children as the same children would sneak back to my painting about once an hour to make sure they were still in the painting. They were so engaged and it was incredible to make them feel included and excited about something creative. In particular one girl, Chloe stood out to me as she was more than an admirer, she was an assistant. This beautiful 6-year-old gave me advice about what things she wanted to see in the festival, composition, and she even got to paint a little of it with me. I appreciated her excitement and loyalty to the piece. She helped me out, and I enjoyed the company. Her family, all featured in the piece, ended up purchasing the piece through the auction and I could not be happier about it. Pretty special and it was a great experience. 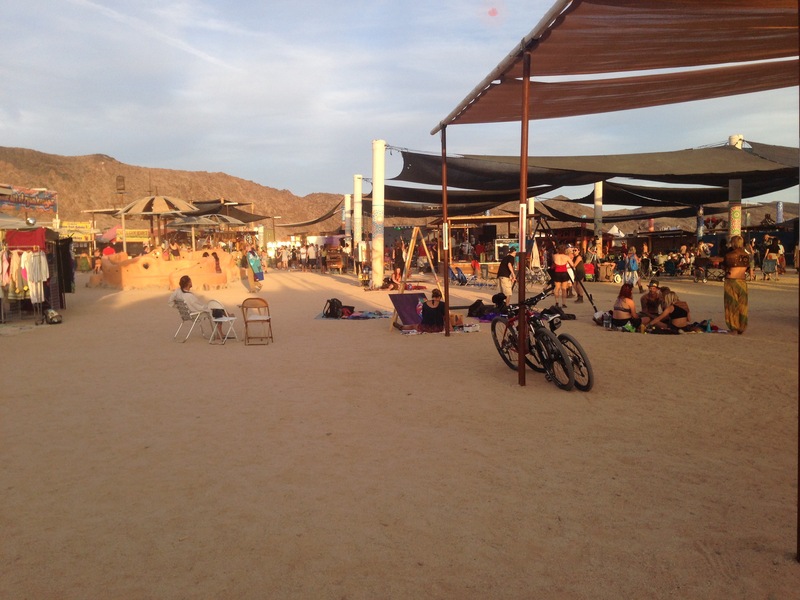 Until next festival, Joshua Tree, hope to see you all in May!